This stirrup jar comes all the way from the Bronze Age. 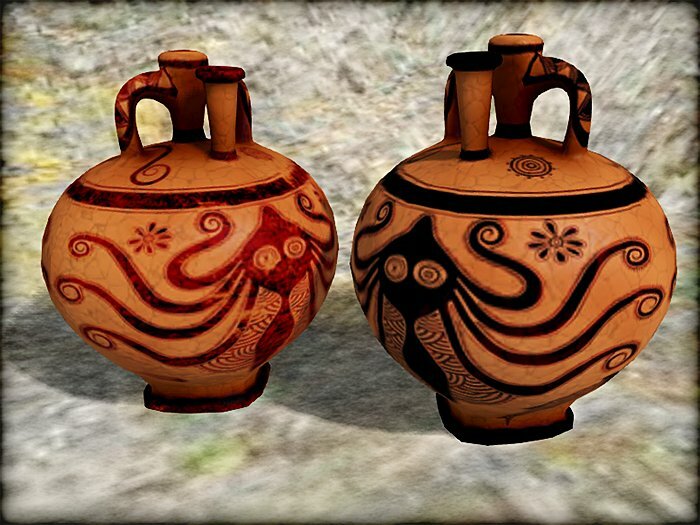 The pattern, although heavily inspired by talented Mycenaean artists, is hand-drawn (hand-vectored-and-painted, technically!). The materials use custom specular and normal maps. Featuring original mesh and textures, your Stirrup Jar also benefits from fine-tuned Level of Details and Physic shapes. What it means to you is that it'll look good up close and personal and from afar too, while still keeping a reasonable land impact. - Includes two versions: one "new", and one antique.